The following article on the history of the Bhagavad-gita is presented on Sri Gita Jayanti, the 5144th anniversary of Sri Krsna speaking the Gitopanisad/Bhagavad-gita. Since time immemorial, Srimad Bhagavad Gita has been a prime source of inspiration for many great thinkers and philosophers in both the east and the west. In ancient times, the first commentary on the Gita was written by Adi Shankara, who was the first acarya to treat it as a freestanding text. Subsequently, other great acaryas such as Ramanuja, Madhva, Sridhara Svami and others wrote commentaries on the Gita that presented its essential devotional significance, in stark contrast to Adi Shankara’s impersonal interpretation. Originally, Srimad Bhagavad Gita is part of the ancient historical epic, the Mahabharata, composed by the great sage Vyasa in approximately 3100 BCE. The eighteen chapters of Bhagavad Gita are found within the Sixth Canto of the Mahabharata known as the Bhishma-parva, which altogether contains 117 chapters. Initially Vyasa wrote the 8,800 core verses of the Mahabharata and later his disciples Vaishampayana and Suta added further historical details until the Mahabharata finally consisted of 100,000 verses – seven times the size of Homer’s Illiad and fifteen times the size of the King James Bible. The word Mahabharata means ‘The History of Greater India’ and recounts the story of two feuding royal families, the Pandavas (the sons of Pandu) and their cousins, the Kauravas (the sons of Dhrtarashtra). Both Pandu and his brother Dhrtarashtra belonged to the royal Kuru Dynasty of Hastinapura (modern day Delhi). Although Dhrtarashtra was the elder of the two, he was born blind and so the throne was passed on to Pandu, who became the heir-apparent. However Pandu died untimely, leaving five children – Yudhishthira, Arjuna, Bhima, Nakula and Sahadeva. While the Pandavas were still young, their uncle Dhrtarashtra assumed the throne as regent until they were of age to rule the kingdom. Yet due to his excessive paternal attachment, Dhrtarashtra schemed that his own sons, led by the corrupt Duryodhana, would ascend the imperial throne. To this end, and with the consent of his father, Duryodhana made several assassination attempts upon the lives of the Pandavas. Despite the wise counsel of his grandfather Bhishma, his uncle Vidura and his military teacher Drona, Duryodhana continued to plot against his cousins. Yet, due to the protection of Sri Krsna, the Pandavas were able to foil all his murderous attempts. Historically speaking, Sri Krsna was the nephew of Pandu’s wife Queen Kunti and was thus the cousin of the Pandavas. However, Krsna was not simply a royal prince, but the Supreme Person Himself who had descended to earth to perform His pastimes and to establish the principles of dharma. Due to their righteous behavior, Sri Krsna always favored the Pandavas. Although the Pandavas sent Sri Krsna as an ambassador to sue for peace, Duryodhana blatantly refused to listen. War was now inevitable. Rulers as far west as Syria and as far east as China came to take part in the battle – some supporting the Kauravas due to their political designs, and others favoring the Pandavas due to their piety. During this fratricidal war, Krsna stated that He would not take up arms for either side, but accepted the position as Arjuna’s charioteer. Thus, in the month of December, in 3138 BCE, both armies assembled on the planes of the holy place known as Kuruksetra. The significance of Kuruksetra is related in the Vamana Purana that narrates how the virtuous king Kuru, the ancestral patriarch of the Pandava and Kaurava Dynasty, performed rigorous austerities at Kuruksetra. Because of this act, Kuru was given two blessings – firstly that Kuruksetra would be named after Kuru and secondly, that anyone who died at Kuruksetra would attain the celestial planets. Bhagavad Gita is spoken on the first day of the war at Kuruksetra. As the two armies prepare to fight, the blind Dhrtarashtra sits in his court with his faithful servant Sanjaya and inquires from him as to what the virtuous Pandavas are doing. Sanjaya, a disciple of the great sage Vyasa, had been blessed with the mystic power to observe the conflict far from the battlefield at the palace in Hastinapura. 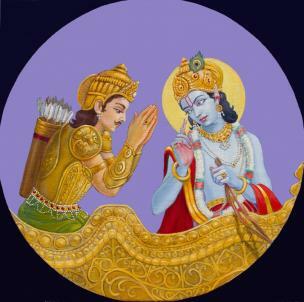 Sanjaya then narrates to the old emperor the sacred conversation between Shri Krishna and Arjuna. Thus Srimad Bhagavad Gita was received by Sanjaya and repeated to Dhrtarashtra for the spiritual benefit of all humanity. 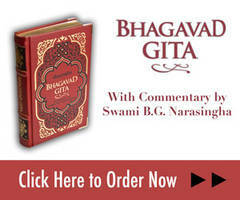 Bhagavad Gita is available at our Srimad Bhagavad Gita website, at Devavision online store, and at Amazon.com.